Call it the luck of the draw, bottom of the barrel, divine intervention, overlooked, under picked, dumb luck, fu**ed up, etc...eventually every match must meet its maker and have its face violently rubbed in a friction move to ignite in a final blaze of glory! 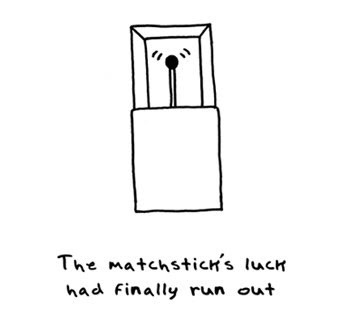 The "real luck" is what the match is used for? Lighting a cigarette to continue a slow death, lighting a candle to see through the darkness, lighting a fireplace to provide comfort and warmth, lighting a stove to keep the body nourished, lighting a bomb to keep hate alive. The question is, when you're the last match in the box, what do you want to light up? As Neil Young says, "It's better to burn out than to fade away." Light up your life! Maybe, when you run out of friends in your little box of a world, it's time to move on. The match's purpose is to be struck, light, and... well, after that it's out of his hands. Strike that, matches don't have hands.